As I rummage through the drawers in my sewing room I keep on finding treasures that I have purchased but not done anything with. Here is the first of two recent finds. This is a rather large dresser scarf, about 32 inches square, with some really lovely embroidery on it. This is one corner, with the design repeated at each corner. Notice the hems are Point de Paris, all done by hand. 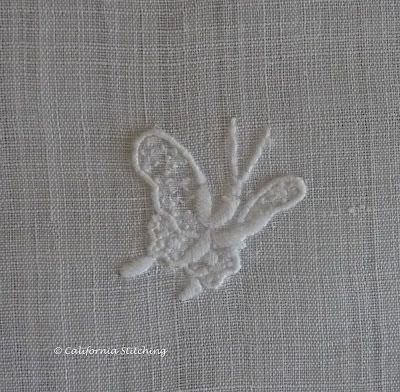 On each of the four sides is this delicate little butterfly. The back of the embroidery is almost as pretty as the front. Sorry, no picture of the back. Not to be content with the embroidery, the maker withdrew threads in the center of the square and embroidered over the semi open spaces. (There is probably a term for that, I'm just not thinking of it right now). This whole piece is an interesting example of combining surface embroidery with drawn work. I don't think I've ever seen anything like it before. 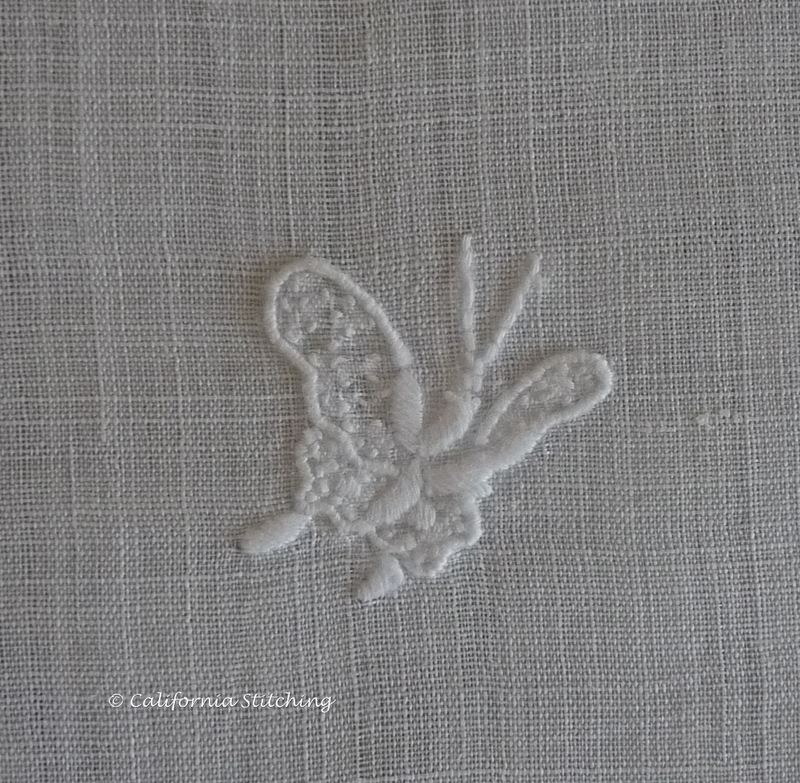 Then I found these placemats with a table runner in Madiera applique. 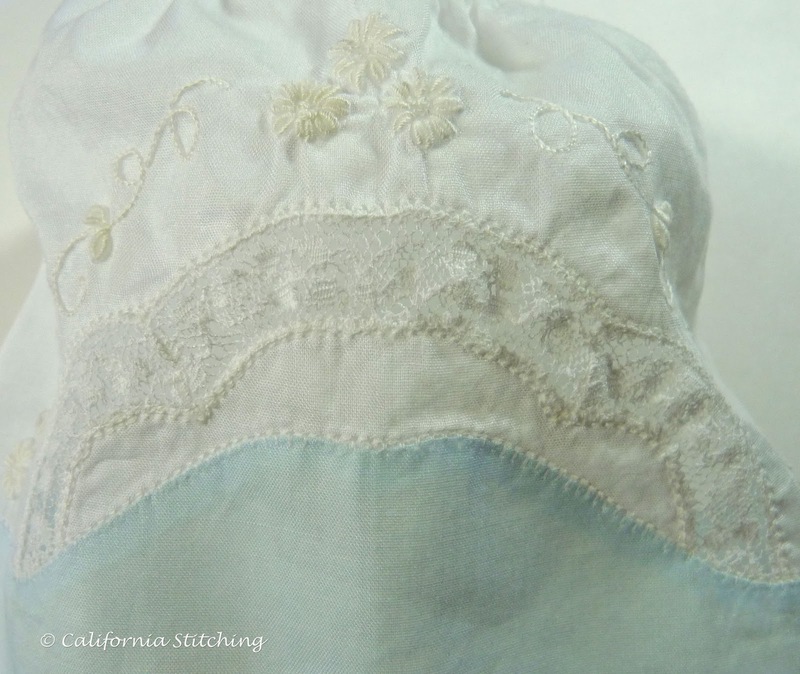 The center is cotton organdy with a border and flowers of cotton batiste. All of the flowers and the entire hem are hand worked Point de Paris. Can you tell I just love Point de Paris? The stems have just the right degree of crookedness to make them look real. 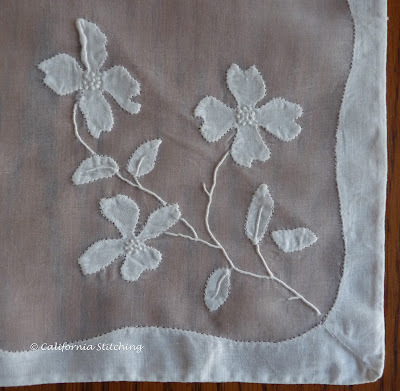 The stems, granitos in the center of the flowers, the veins and the turned over petal all combine to give a bit of depth and realism to the embroidery. 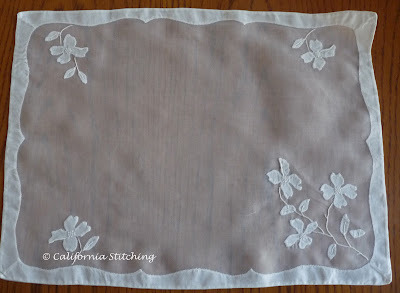 There were eight placemats, plus a table runner, and all for only $35.00! But these things are really a bear to iron. The organdy tends to stretch, so I had to iron the hems first, then the flowers, and then steam the organdy centers to shrink them to fit. It took me several days to iron them as I could only manage a few at a time. 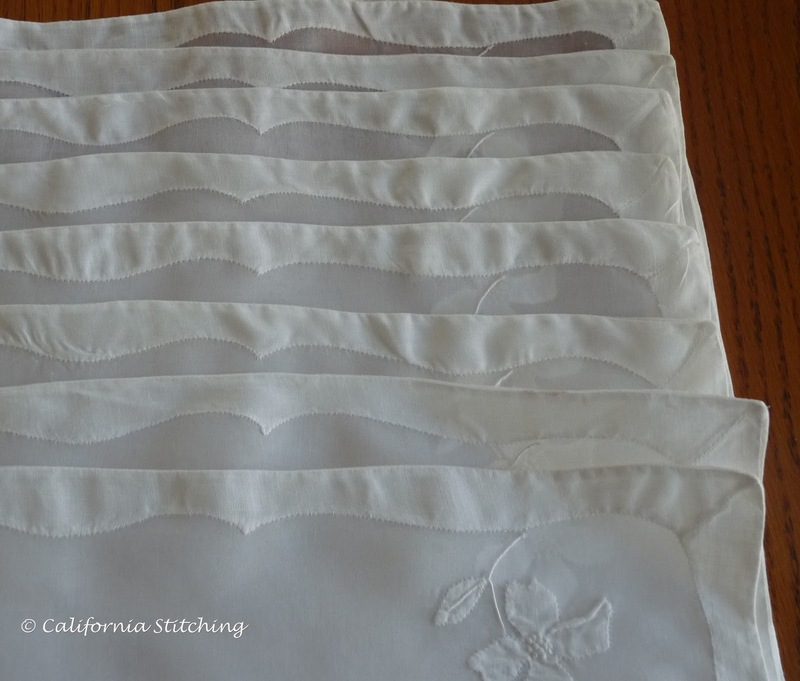 To store them I'll roll them over a muslin covered tube so I don't have to iron them again. Oh, and in the humidity they tend to warp. Not that we have a lot of humidity here, but it does get to about 65% at night. Positively dry compared to the East and Midwest. There is no way I'll be ironing them again before I store them. The Golden Pomegranate is coming along slowly. I was hoping to get it finished before I go to San Diego for the Jane Nicholas Persian Peony class, but that didn't happen. So I am bringing it along and will try to get some pointers. I'll post photos after the class this weekend. I can't believe what I've just done. 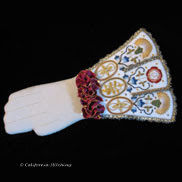 I've gone and registered for the Floral Glove Needle Case over on the Thistle Threads Online University. With all the various projects that I am now working and have coming up over the next month, I went and added another. I'm getting addled. But whenever I read another embroidery blog describing working on this, I kept kicking myself for not signing up for it. So, we'll take it month by month and see where it goes. It doesn't start until November 1 so I have a bit of time yet. The others who took this class, as far as I know, are Coral-Seas at Threads Across the Web, who finished her project just last month. The only other one I know of is Mary Corbet at NeedlenThread. If you follow the link you will go to her last known post of this project, at least the last one that I know about. I follow her pretty closely so I think I would have remembered if she finished the project. Has anyone else out there taken this class? Have you finished it, or just put it down and went on to something else? If so, maybe reading my posts once I start will inspire you to finish it! A friend of mine recently asked where she could find some beginner's embroidery kits. She wants everything included, as she is new to embroidery and doesn't know where to start. 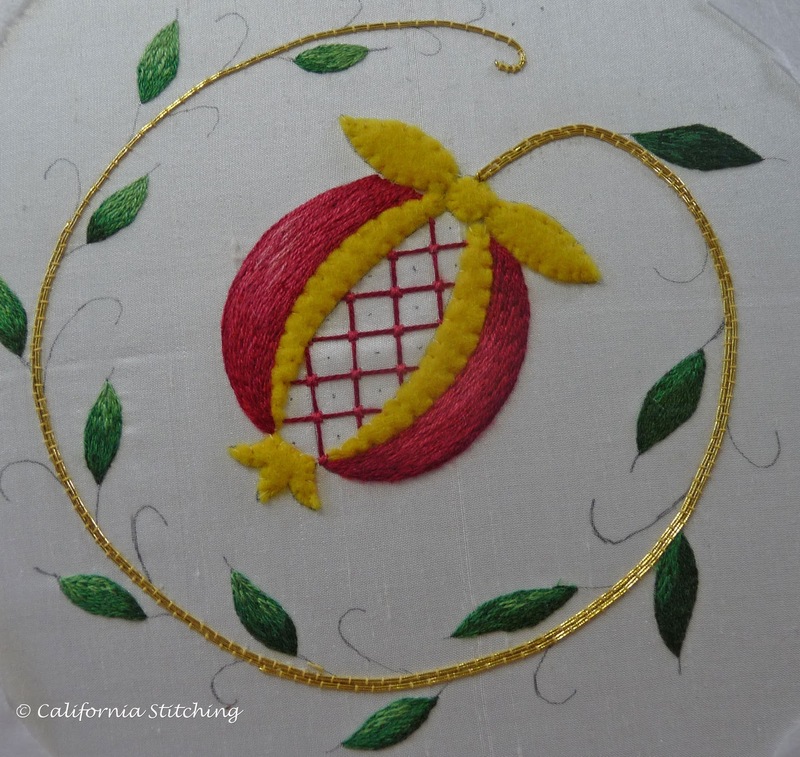 So here is a list, by no means exhaustive, of embroidery kit resources for beginners. The Wooly Thread in Yakima, WA have several crewel kits from Wool and Hoop in Texas and which are perfect for a beginner. The kits contain everything needed to complete the project, including printed fabric, threads, needle, and even blank greeting card. Tristan Brooks Designs in Memphis, TN has the darling Newbury Smalls that I posted about last year (and will do so again soon). These kits are well suited for beginners, but be wary of the amounts of threads given. 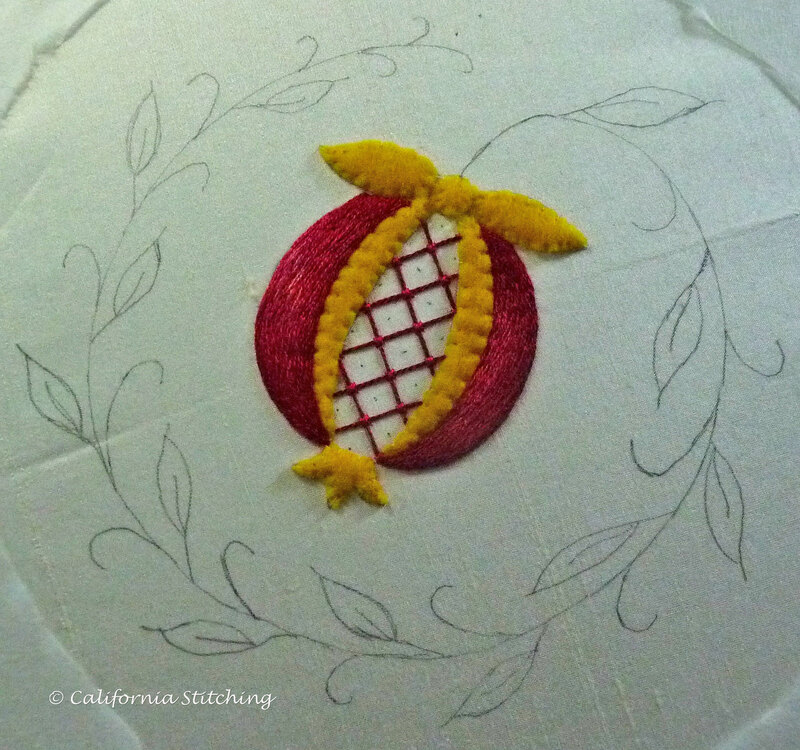 When I worked on the Elizabethan Pencil Box I practically ran out of thread. No room for error in these kits! Needlework Corner in Carbondale, IL, carries many kits from beginners to advanced, and also has types of kits not commonly seen, such as Swedish Huck Weaving and Japanese Sashiko embroidery. I'm not really much into cross stitch, having only worked a couple of projects, but Herrschner's and Joann's online store all carry huge assortments of kits from beginner to advanced. 1-2-3 Stitch in Bluffdale, UT, has all sorts of embroidery projects, but be careful, many don't include the floss. They do have a wonderful selection of floss, including Anchor, Weeks Dye Works, Caron, Threadworx, and many more. Online only. 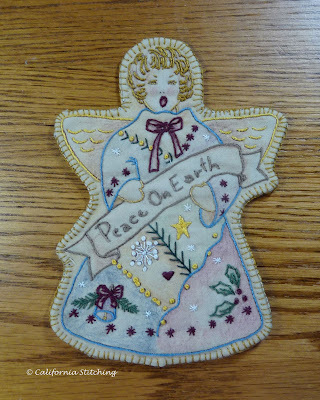 Keepsake NeedleArts in Center Harbor, NH, has a bit of several different forms of embroidery, including crewel, cross stitch, silk ribbon, and candlewicking, just to name a few. This is a sister company to Keepsake Quilting, which is very near and dear to thousands of quilters. 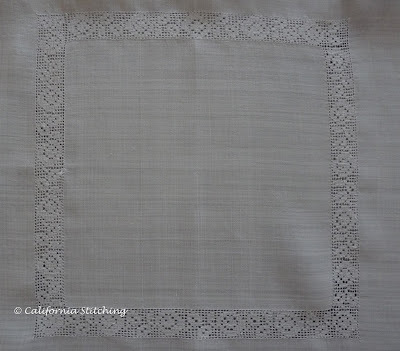 It seems to be online only, but as I haven't been to the Keepsake Quilting store to see if they have embroidery kits in stock, I can't be sure. Nordic Needle in Fargo, ND, specializes in Hardanger, Brazilian Embroidery and Silk Ribbon Embroidery. They also have Trish Burr needle painting kits, but these don't have the floss! Thistle Threads in Boston area, MA, specialized in historical techniques and has several kits for sale. The Needlework Nibbles, however, are limited edition and with the exception of the Tulip Slip are completely sold out. You can see my attempt at the Tulip Slip here. Online only. 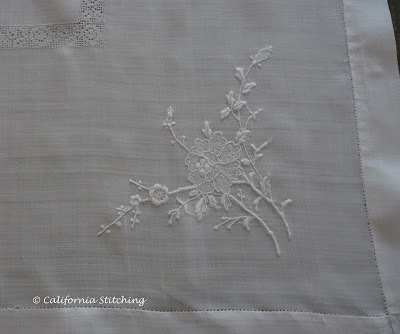 Wendy Schoen Design in New Orleans, LA has kits in several different techniques, including cutwork, Madiera applique, shadow work, and white work. Virtually all of her kits work into some sort of baby garment, such as a dress, bibs, etc. All of her materials are exquisite. Old Fashioned Baby in Baton Rouge, LA, also has kits that work into a baby garment. Of course they do, with that title! As with Wendy Schoen Design, all materials are very high quality and wonderful to use. 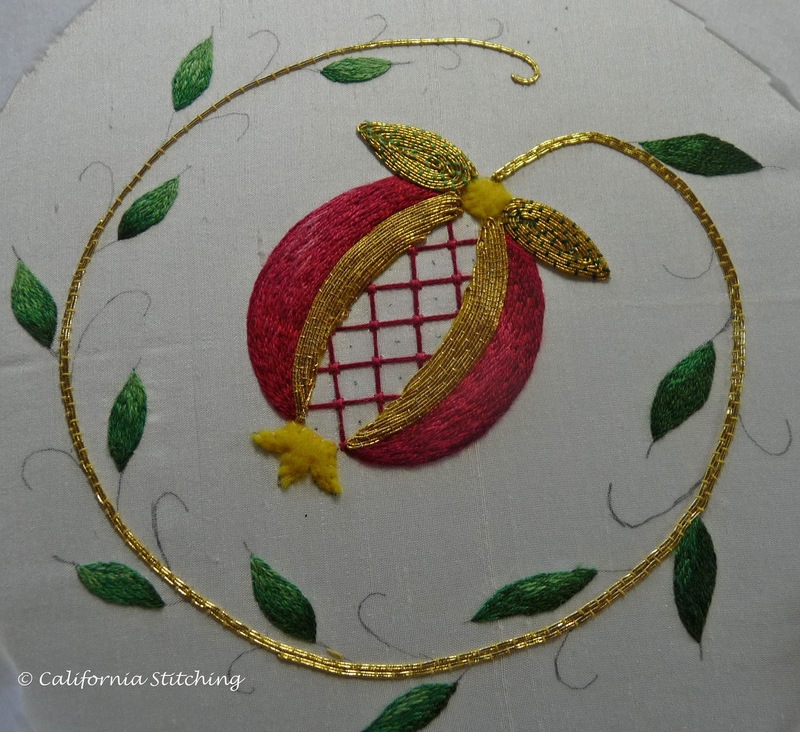 Tanja Berlin, in British Columbia, Canada, has the most amazing goldwork, blackwork and needlepainting kits that she designs and teaches. Many of the kits are suitable for beginners and all come with free email advice as you are working the kit. Online only. As I mentioned, this is by no means exhaustive, but will give the beginner a good source of suppliers for complete kits. I need to point out that I receive no money or gifts from any of these companies. I have ordered from many of them and like their products and customer service. The others I have encountered while searching around on the internet. This past weekend was fairly productive, as far as The Golden Pomegranate progress is concerned, even though I haven't been able to write it up until now. As you can see, I've finished the the threadpainted leaves and have made a good start on the main stem. The stem is No. 5 passing thread couched with gold colored Mettler cotton thread, color 500. If you look at the stem across from the sepals, you'll see that it is not a smooth curve. You can also see a bit of the "wobbly" stem to the left of the pomegranate. 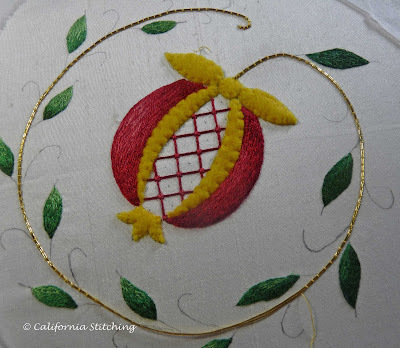 If you notice where I've started the couching at the node of the pomegranate, you'll see that I left a tail of the loop above the surface and consequently had to plunge them to the back side of the work. This was a mistake! I should have squeezed the loop to a point and butted it against the felt of the node. After all, it will be covered by pearl purl eventually. I was so unhappy about the wobbly stem that I took out the couching threads and recouched the gold passing thread so that the curve was smooth. Much, much better. 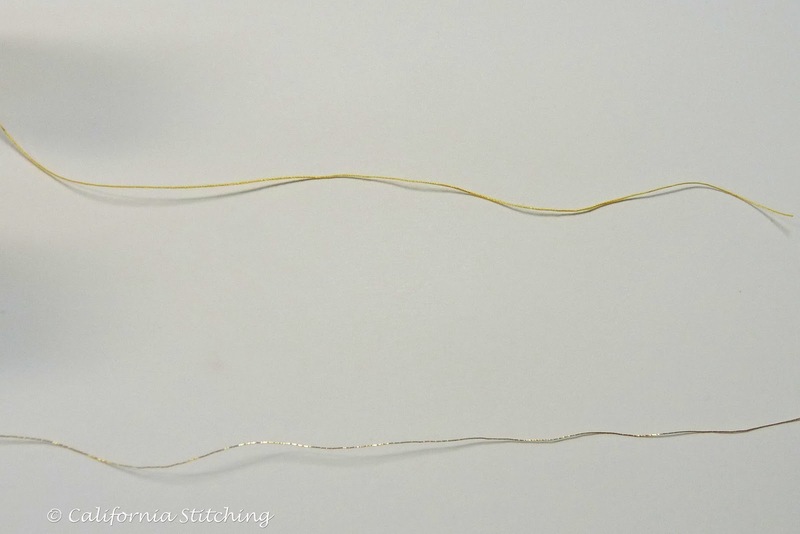 This shot shows the original double passing thread, along with another double thread that ends at two different locations. I also made sure that I stitched the couching threads perpendicular to the tangent of the curve (remember high school geometry?). This looks so much better than when the stitches are more haphazard. The next section dealt with the pith, which used the No. 8 Japanese thread couched down in over the felt. 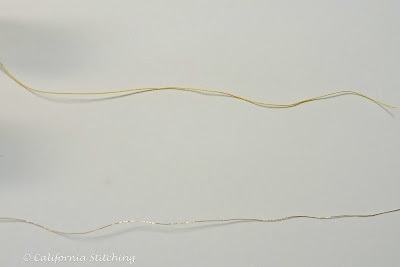 After rummaging through my threads, I found a spool of Gutermann metallic thread, shown below the Mettler thread in the photo above. I used this to couch the Japanese thread for the pith and I'm please at how nice it looks. Then I went on to the leaves above the pomegranate, which also used the No. 8 Japanese thread. This time I couched the thread with the green silk floss, which adds just the right color of green to the leaves. Notice how shading is achieved by using a light green on the left leaf and a darker green on the right. I have to admit that couching the gold threads down isn't too easy, especially when you have to spiral the threads in a tight corner. I could have done better, but there is no way to take the threads out and redo them. Oh well, I hope I can hide any blank spots with the pearl purl that will define the leaf's vein. Here's an angle shot so you can see how nicely the gold glints in the light. Of course, all couching threads need to be waxed before using. This is necessary whether using cotton thread, metallic thread, or silk floss in all the photos shown above. Waxing keeps the threads smooth and really does reduce the amount of tangling. Another good tip is to not to use too long a thread. It's better to keep the threads short so they are easily manageable. Now it's on to the pearl purl outlining the large leaves. 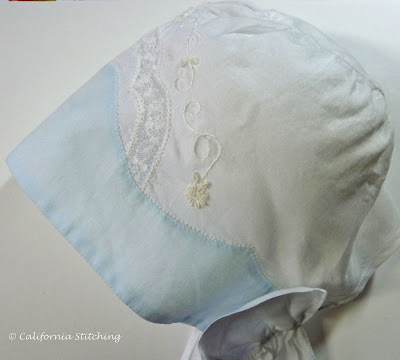 I'm still going through my granddaughter's baby clothes that I have in storage and found these bonnets and just had to share them with you. This is from Jeannie B's Old Fashioned Baby Bonnets pattern. As I made it just for the the fun of it there is no corresponding daygown. It was pretty quick and easy to sew, having no embroidery just the Swiss insertion and lots of lace. 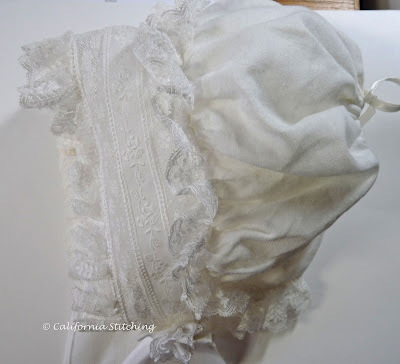 This bonnet, however, belongs to the Heirloom Potpourri Daygown by Claudia Newton. I was so glad to find this as I was afraid it had been lost. The class that I took when I made the dress didn't include the bonnet, but I bought some extra fabric and made it, probably from a Jeannie B. pattern. She has so many bonnet patterns and I have so many of her patterns! I have to say I love them all and will probably fill out my collection at the SAGA convention next month. Close up of the stitching and embroidery on the top of the bonnet. 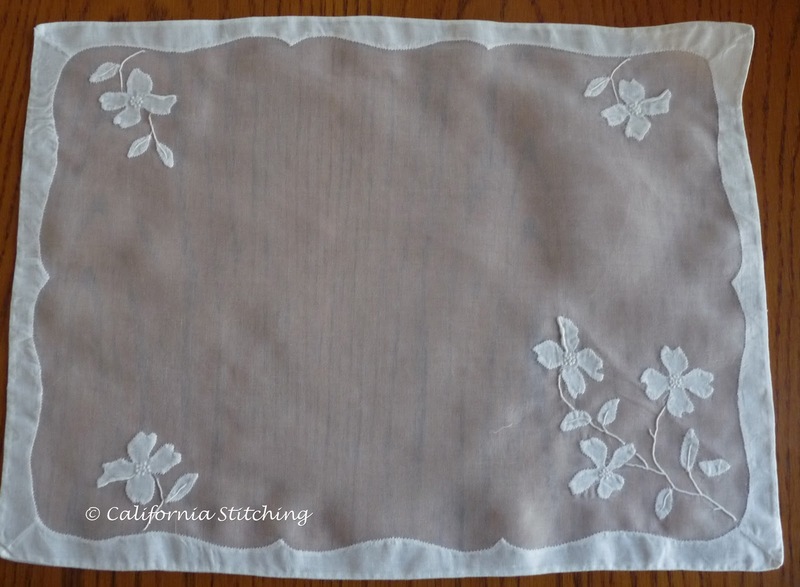 The Point de Paris stitching here is all done by machine, both for the Madiera applique and the lace insertion. 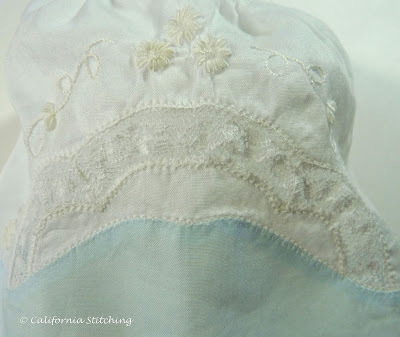 I did cut away the fabric from behind the lace. You can't see it here because I put a ball of polyester stuffing inside the bonnet so it would photograph better. Too bad I didn't get the photo of the baby in it. It's Friday afternoon and I'll be sorting out more baby clothes this weekend, hoping to find some other items that haven't yet surfaced. By the way, my newest grandniece was born last Thursday, she and mom are doing well. My brother is just tickled pink to be a grandpa. I hope to have some progress on the Golden Pomegranate to show you soon. It's coming along very slowly, but I'll tell you about that later. 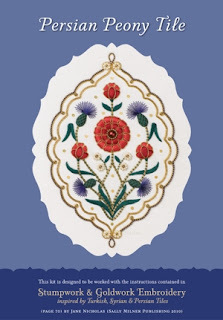 In just under three weeks, I'll be taking the Persian Peony Tile Class by Jane Nicholas in nearby San Diego. Jane is a world renowned teacher from Australia so this is a perfect opportunity to take classes from her. 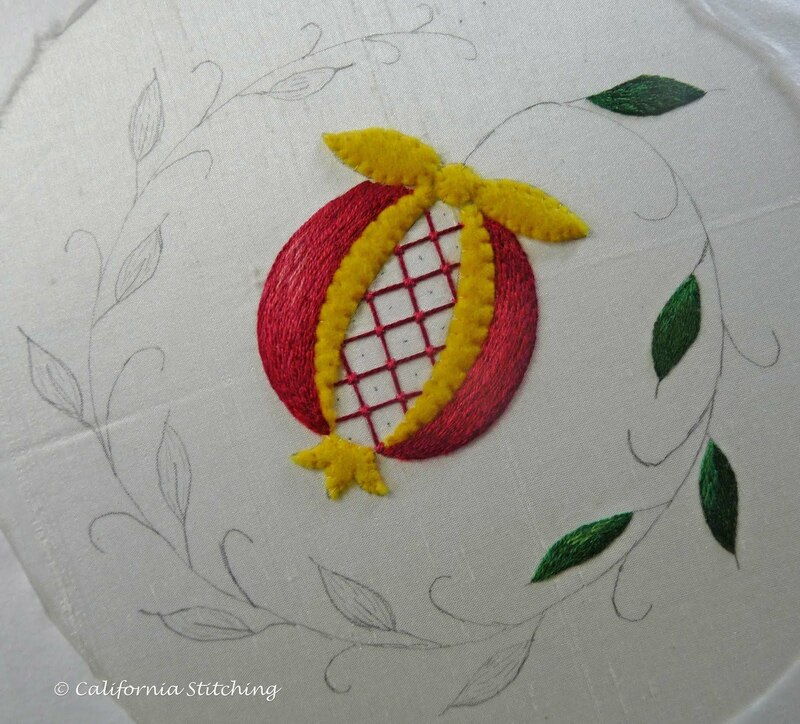 I'm sure you've seen the reviews of her many books on Stumpwork, Goldwork and other embroidery techniques on several other blogs and embroidery sites. This particular project is from her latest book, Stumpwork & Goldwork Embroidery, inspired by Turkish, Syrian and Persian Tiles. You can find a review on NeedlenThread by Mary Corbet and can order it from a variety of sources, including Amazon. I'm going to order mine today! The class is being sponsored by Muchas Manos, an EGA chapter in San Diego. They have set up a special website for the two classes they are offering by Jane. Someone in that group is pretty good using the internet! They even have a Facebook page! It seems that they may still have a few slots open, so if you're in the Southern California area this might be a great way to learn from this gifted teacher. You can check out her other class offerings on her website. And yes, this is the same San Diego that had a blackout two days ago, on the last day of a short heat wave. It took me 2 1/2 hours to get home (I work in Rancho Bernardo, in North San Diego County) and since my house gets power from San Diego Gas and Electric, we were without power as well. So we sat outside with candles, watching the stars. 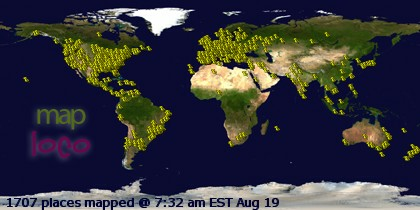 It's amazing how many more you can see without all the light pollution. Power was restored some time in the wee hours and we had a normal day at work on Friday. Today we have a thunderstorm rumbling overhead, threatening the Cross Country Invitational at the local high school. Enough rambling, time to get some stitching done. Have a great weekend! Today is Labor Day in the US, and the last day of my four day weekend (I had Friday off due to my work schedule). I didn't get much stitching done at all. In fact, I never even went into my sewing room on Friday. 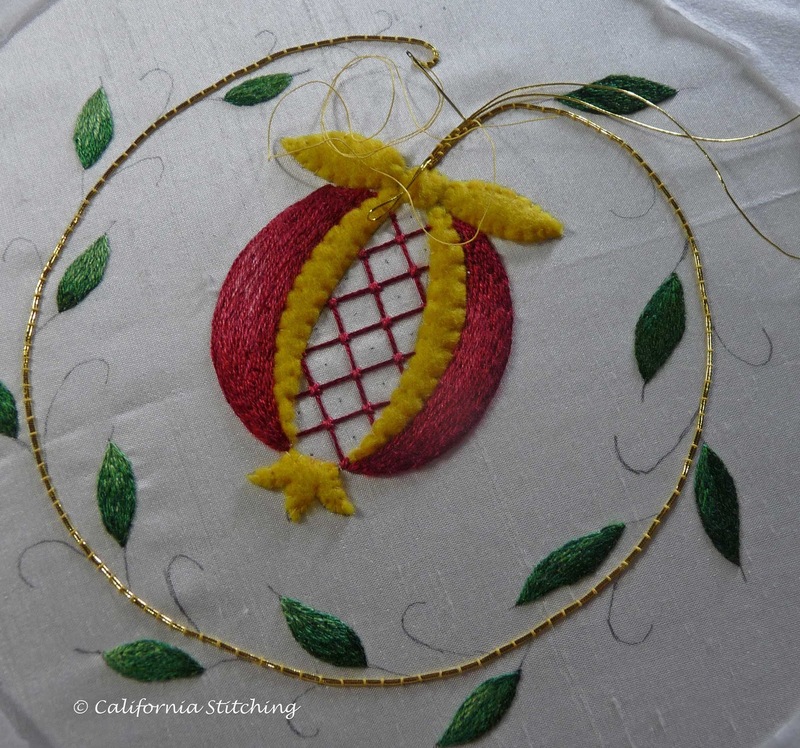 I did manage to put The Golden Pomegranate back into the hoop and get a bit done on it. I took it out two weeks ago before leaving on vacation to keep the hoop marks at a minimum. When I last left this, I had stitched the left skin portion. This weekend I managed to get the right skin and the crosshatched pulp finished. See how the left skin is a bit flat on the outer side? I just noticed it today and did it ever annoy me. I filled it out a bit and I feel much better about it. It's nice and rounded now. Isn't it a bit silly how something can be so annoying and get fixed with just one thread's thickness? 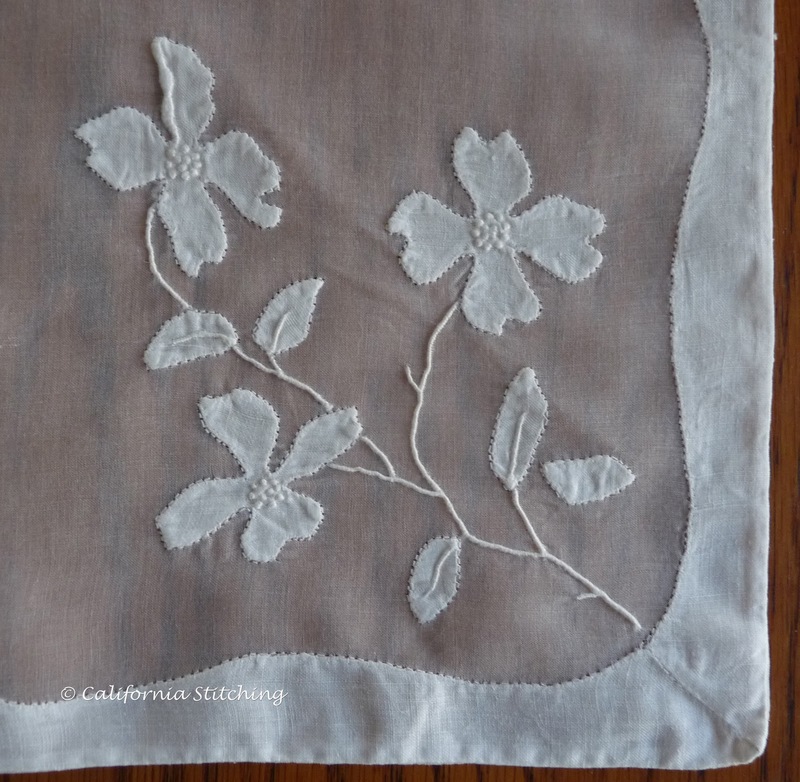 I also managed to embroider four leaves. 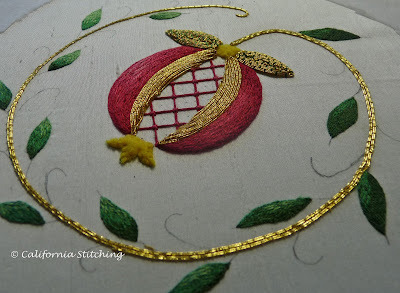 Only eight more leaves to go and I can then start on the goldwork. I just love stitching with silk threads, but am really looking forward to working with the gold materials on this project. So why didn't I get much stitching done this weekend? Part of the reason is that we were gardening. 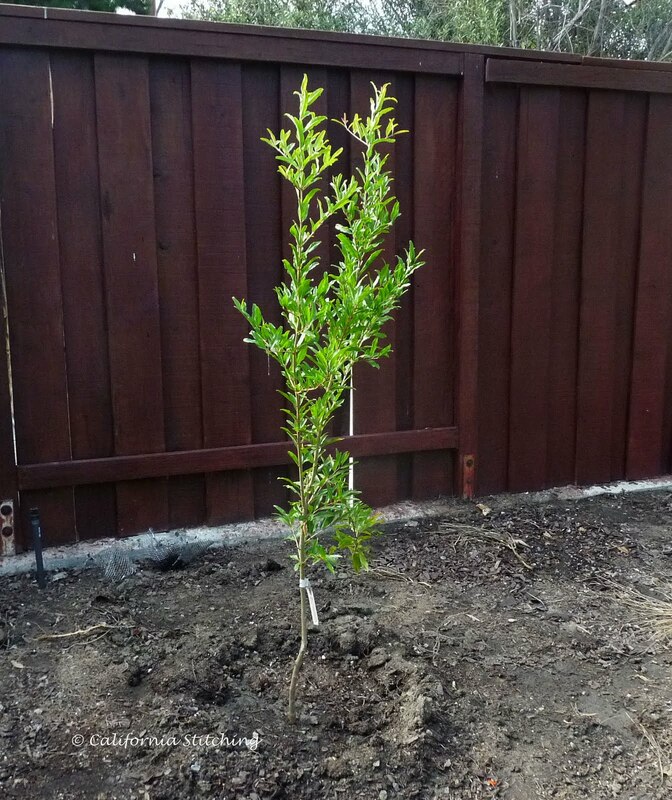 Look what we planted - a pomegranate tree! I can't wait for it to bear fruit, as pomegranates seem so California to me. Probably because when we were young we would go to Knott's Berry Farm in Buena Park where there were pomegranate trees all along one of the walkways. I haven't been there in decades so I have no idea if they're still around. And yes, I do know that they are not native to North America but came from the Caucasus and Himalayas. Time to get back to stitching, maybe I can get another leaf done before dinner! So what did I do on my summer vacation? I started sewing for Christmas! I picked up this little darling at the International Quilt Festival in Long Beach back in July and brought her along to stitch in the airplane. 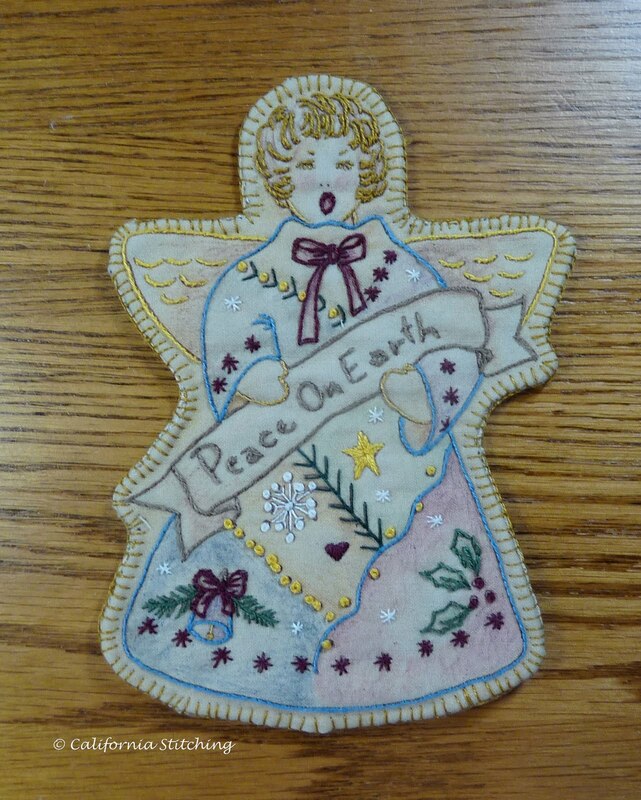 It is one of a series of Vintage Christmas Ornaments by Chickadee Hollow Designs and was sold in several of the stands at the market. What is unusual about these kits is that the fabric is not only preprinted with the design but also colored in several areas. The kit gives the colors of DMC floss to use, but not where to use them. Most of this is fairly self explanatory, but I ended up not using several of the colors as I couldn't figure out from the photo on the package where they went. But it came out cute anyway. All she needs now is a hanging loop. I did managed to finish the bullions on the Waterfall Christening Gown, so now all that needs to be done is to construct it. I'm actually looking forward to that as I haven't done much on the machine lately and I'm itching to get to it. I also managed to smock three Wee Care gowns but the really important thing is we got out of Connecticut Saturday morning ahead of Hurricane Irene. Our son had to stay behind, but as he is in Graduate Student Housing with three foot thick walls on the sixth floor, we weren't too worried for him. Eastern Connecticut didn't have too much damage, but I really feel for the poor folks in the western part of the state and in Vermont. So now it's Labor Day weekend here in the US and I hope to get my Golden Pomegranate back into the hoop and get some stitching done! I hope all of you have a great weekend!